Joe Stock on Bird Peak, Western Chugach Mountains, Alaska. Photo by Mark Smiley. Roots: Joe Stock is always looking for reasons to turn around. It's right there on one of his many checklists. His 30-year career in the mountains—New Zealand, the Alps, South America, and Alaska, where he literally wrote the book on backcountry skiing—has been ruled by systems. 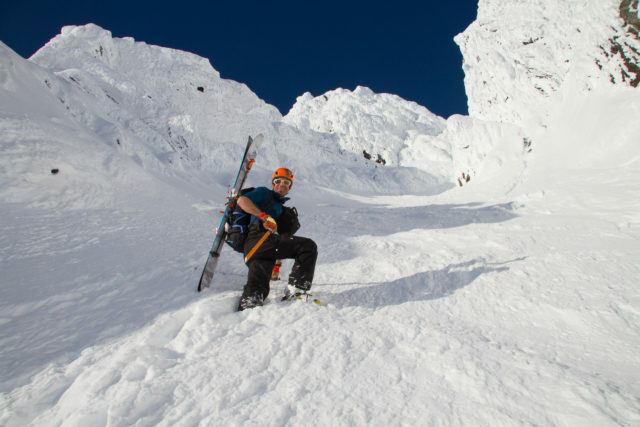 Stock is careful to stay abreast of local trends in both conditions and best practices, uses checklists to prep and inventory his gear, and follows the same set of rules every time he goes out. Stock's systems are scientific because he's a scientist. He has a graduate degree in watershed science. He's also fully certified by the IFMGA—the PhD of mountain travel. But Stock is no stodgy intellectual. He teaches his subject matter to students at the Alaska Avalanche School and the Northern Warfare Training Center with levity. While guiding in the Chugach, he waxes philosophical about the joys of mountain travel, and does a Neanderthal-skier impression that leaves his audience in stitches. We all move so fast. And when we move too quickly in complex situations, we tend to make rushed decisions, which lead to errors. I've been working on using calm, meditative breathing in the backcountry. It's a good way to manage those situations, like when you have a difference of opinion with your ski partners or there's an accident. Systems are always evolving. That's how you improve your safety in avalanche terrain. For example, last winter, I made a point of ski testing every run. Instead of just bombing into a slope, I wanted to start each run defensively. Now that I've done it for a winter, I can add something new into my system—something else I need to work on. My human factors are always changing, too. In the past, I've been really goal-obsessed, like a lot of us are in the backcountry. I'd get tunnel vision. These days, I'm focusing more on slowing down. But I'm always trying to target my human factors, to figure out what they are this season. I doubt anyone has the same weaknesses every season. That's the one thing you can never fully understand: What's going on in your own mind. I use a "pre-mortem" to keep myself from getting caught in an avalanche. I think of Craig Medred, this legendary reporter in the Anchorage area who writes up the obituary when somebody gets killed in an avalanche. I printed out a photo of him and taped it to my skis. I stand at the top of the ridge and try to imagine: What would Medred say about me if this slope avalanched? Would my obituary say I was an idiot? It works. Thinking about death is something that happens as you get older. I look back on (my early days), and I can't believe how lucky I got. You can keep having all these close calls, but eventually your luck's going to run out, and you don't know when that's going to be. If there's one thing I'm trying to instill in my students, it's humility. People need to realize that we're not as good as we think we are. Get used to turning around—often. If one of your partners has an opinion, listen to it. We have to get used to saying "I don't know," because we're not always right. You have a responsibility to back off. It's not just you out there—it's the friends and family who care about you, too. That doesn't mean not going out in the mountains. That's what's so awesome about backcountry skiing: You can do it safely. You just have to engage your brain. You can have these incredibly beautiful experiences in the mountains—by being patient and going about it slowly, with humility.